NAPfix® is a ready-to-use drench for the control in sheep of susceptible strains of mature and immature gastrointestinal roundworms (including macrocyclic lactone, benzimidazole, levamisole or closantel resistant strains), lungworms, and tapeworms. 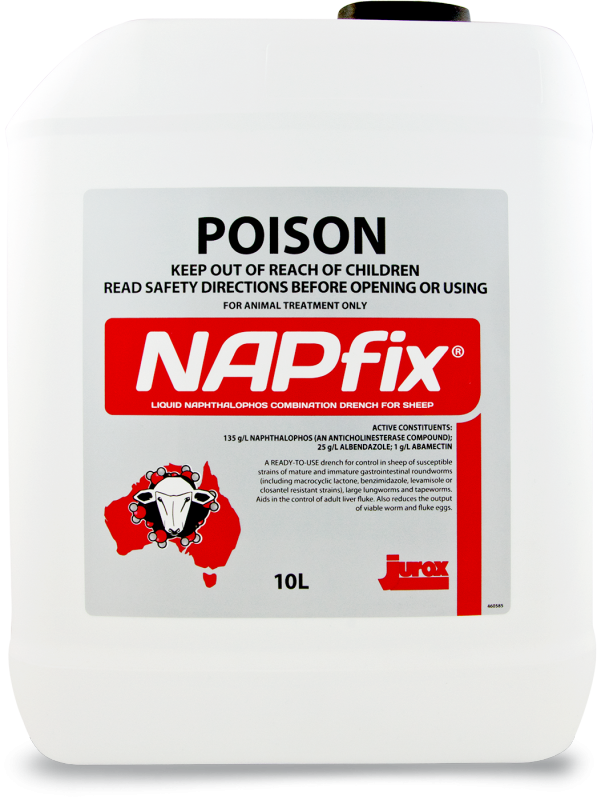 NAPfix® also aids in the control of adult liver fluke and reduces the output of viable worm and fluke eggs. •Barber’s Pole Worm (Haemonchus contortus) - including strains resistant to macrocyclic lactones, benzimidazoles, levamisole or closantel. •Small Brown Stomach Worm (Teladorsagia (Ostertagia) circumcincta) - including strains resistant to benzimidazoles or levamisole. •Black Scour Worm (Trichostrongylus spp.) – including strains resistant to benzimidazoles or levamisole. Lungworm - Large Lungworm (Dictyocaulus filaria). Tapeworms (Moniezia spp) - segments only. Liver Fluke (Fasciola hepatica) - mature fluke. Aids in the control of adult liver fluke. Ovicidal - Reduces the output of viable worm and fluke eggs. Sheep in excess of 80 kg should be dose at 1 mL/ 5 kg bodyweight.